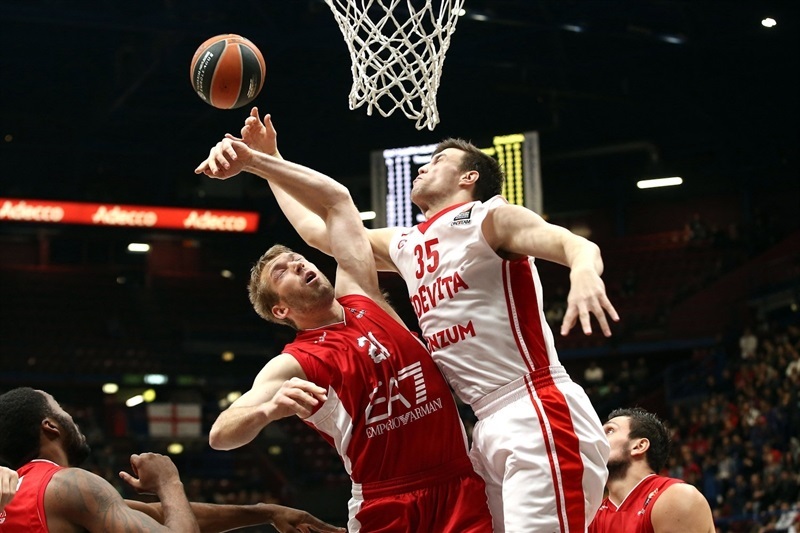 Cedevita seizes second straight road win, 68-77 at Milan! 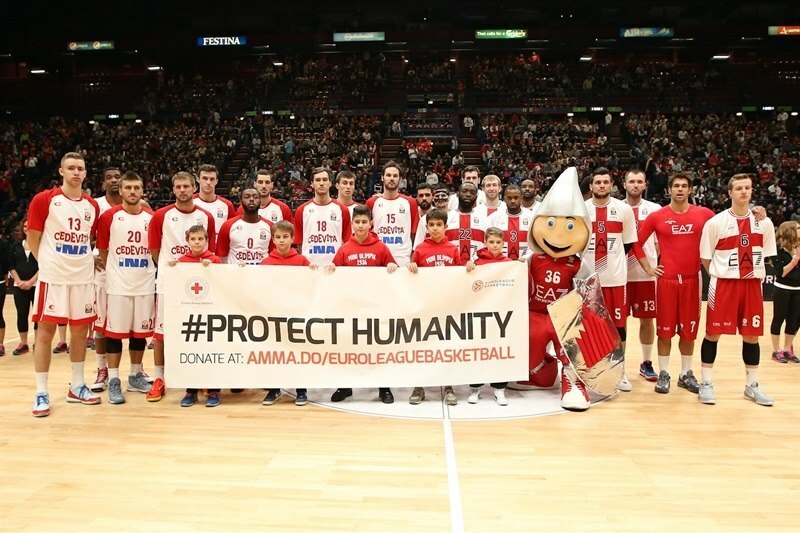 Cedevita Zagreb sent a message around the Turkish Airlines Euroleague with its second consecutive road win of the season on Thursday, a resourceful 68-77 decision against host EA7 Emporio Armani Milan. 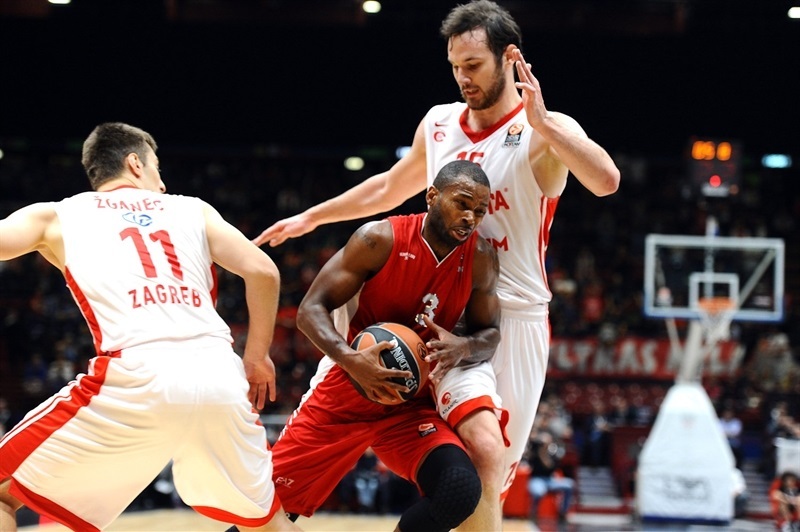 Cedevita moved to 2-2 in Group B a week after it shocked Anadolu Efes in Istanbul, while Milan dropped to 1-3. Cedevita lost all of a double-digit lead after halfitme, but came back to dominate the final quarter. Miro Bilan ruled inside with 16 points, James White did it all with 15 more and Luka Babic scored 11 of his 13 in the final 10 minutes for the winners, who also got 11 points and 6 rebounds from teenager Marko Arapovic. 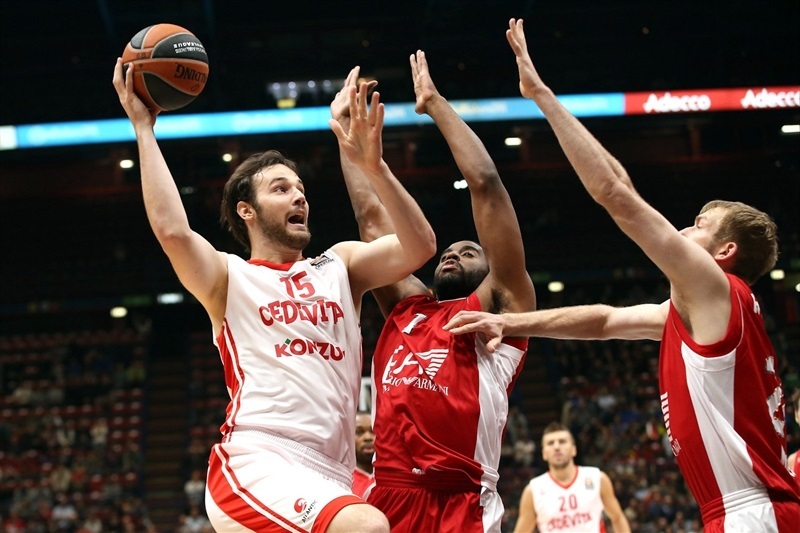 Cedevita went up by 9-19 early but Milan fought its way back to tie and retake leads through the second half. 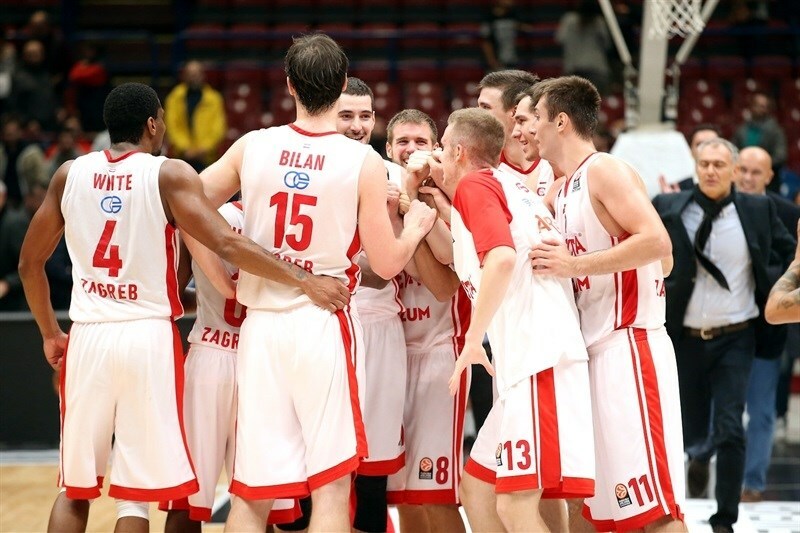 The last tie was at 61-61 with just over 5 minutes left, after which Babic led a 2-13 game-winning break by Cedevita. Alessandro Gentile scored 19, Krunoslav Simon 16 and Oliver Lafayette 14, but poor 39.5% two-point and 29% threr-point shooting spoiled the comeback the hosts had mounted in the middle quarters and Cedevita was able to beat its ex-coach, Jasmin Repesa, on his new home floor. Defense prevailed until Lafayette sent a touch pass to Jamel McLean for slam dunk and a 2-0 Milan lead. Nemanja Gordic matched that with a nifty up-and-under layup. 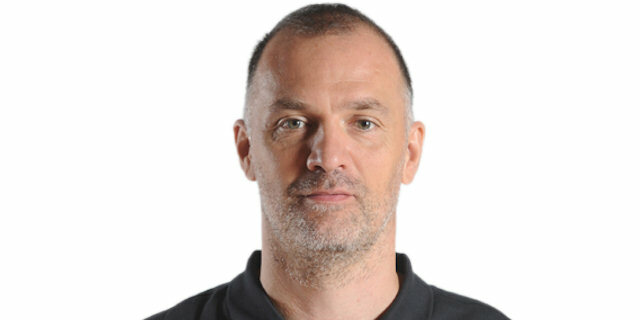 The teams were stuck on 2-2 through the game's fourth minute, when Gordic knocked down a jumper. But Lafayette answered from longer-range with the first triple of the game as Milan went up 5-4. Arapovic downed free throws and Bilan nailed a running hook as Cedevita went back in front, 5-8. Gentile got to the free throw line to make 2 of 2 for the hosts, but Bilan answered with a nifty reverse and Gordic fed White for a fastbreak layup at 7-12. When Arapovic measured off Cedevita's first triple, Milan needed another timeout, out of which Robbie Hummel found Stanko Barac for a slam. But White answered with a short shot and Babic raced the other way with a steal as the Cedevita's lead reached double digits at 9-19. Hummel hit a jumper from the baseline before White found Bilan for an easy layup that was good for an 11-21 advantage for the visitors after 10 minutes. Fran Pilepic walked on court and buried his first shot for a lead of 11-23, Cedevita's highest of the game. Simon was left open and buried a corner triple that Jacob Pullen answered with a two-point jumper at 14-25. Milan Macvan assisted Barac for a close-in basket before Barac pulled an offensive rebound and assisted an open triple by Charles Jenkins at 19-25. 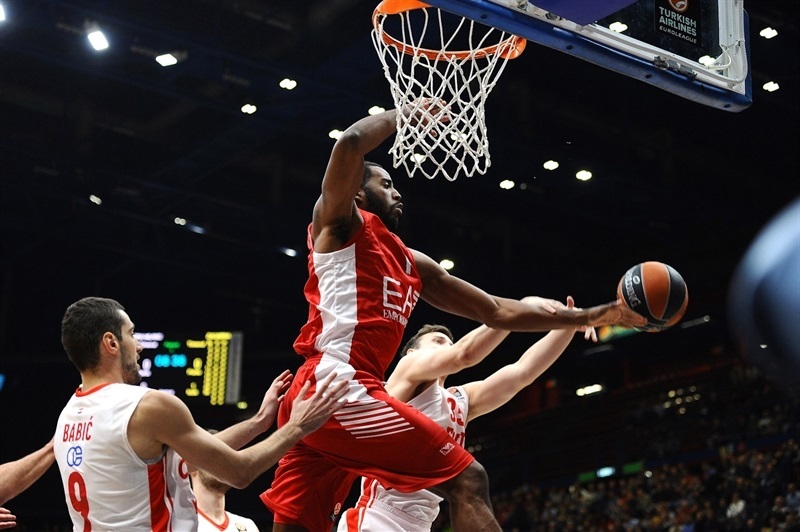 Macvan kept the momentum going for Milan with an unusual shot while crossing the lane, but Bilan stopped it with an open pick-and-roll dunk. Pilepic was left open in the corner and restored Cedevita's edge to 21-30. After a Milan timeout, Simon stuck with his miss, put it down and added a free throw. Gentile made a slicing layup to cut the difference to 26-30. An offensive rebound sent White for one layup and he took it himself for another at 26-34. Lafayette revived Milan with a wing triple. Karlo Zganec added a free throw for Cedevita before McLean did the same to pull Milan within 30-35 at halfitme. McLean made a power move off a rebound and got the basket and a free throw to open the second-half scoring. Bilan answered in close for Cedevita and Arapovic added a foul-line jumper to put the visitors up 33-39. Gentile stepped up for a sweet jumper before Simon drove for a lefty layup and the hosts were within 37-39. Gentile followed up McLean's miss with a tip-in to tie it up and force a Cedevita timeout. Good hustle started a break that Gentile finished as Milan's comeback was complete with a 41-39 lead. Arapovic answered with hook shot, and after Gentile made 1 of 3 free throws, Pullen drove strong to put Cedevita back in front, 42-43. Simon took the lead back for Milan with a big triple from the corner, but Arapovic's tip-in tied it up again, 45-45. Pilepic returned for a step-back jumper and then Arapovic fed White back-door for a dunk at 45-49. 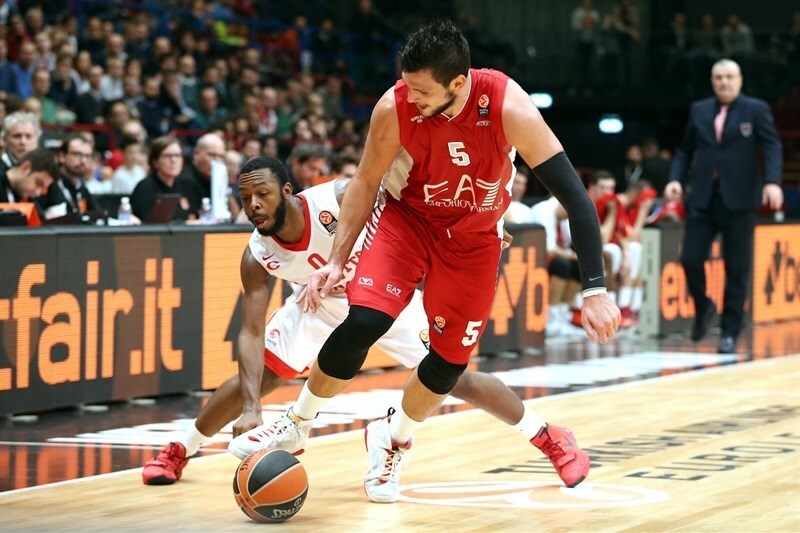 Cedevita was on the break when a turnover sent Lafayette the opposite way for a layup, foul and free throw to keep Milan close at 48-49. Simon broke for the rim and finished there with the last shot of the third quarter to give the hosts the edge back at 50-49 after 30 minutes. 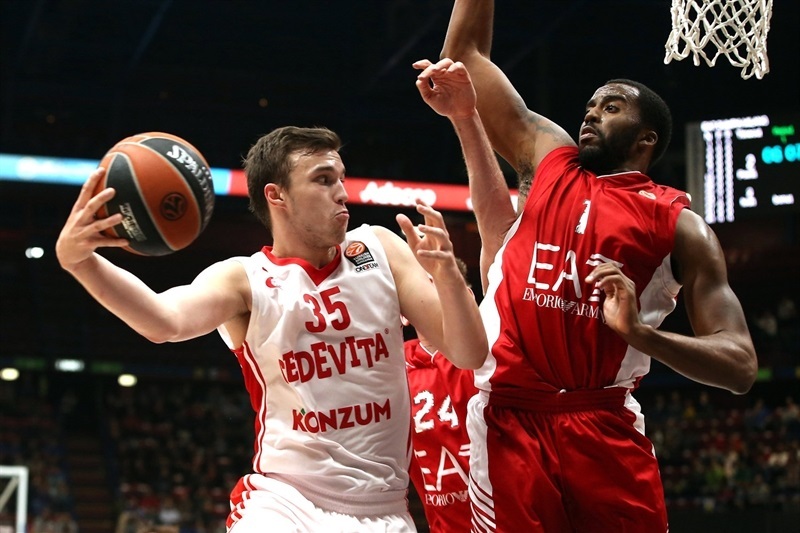 FOURTH QUARTER: Babic leads Cedevita charge to victory! 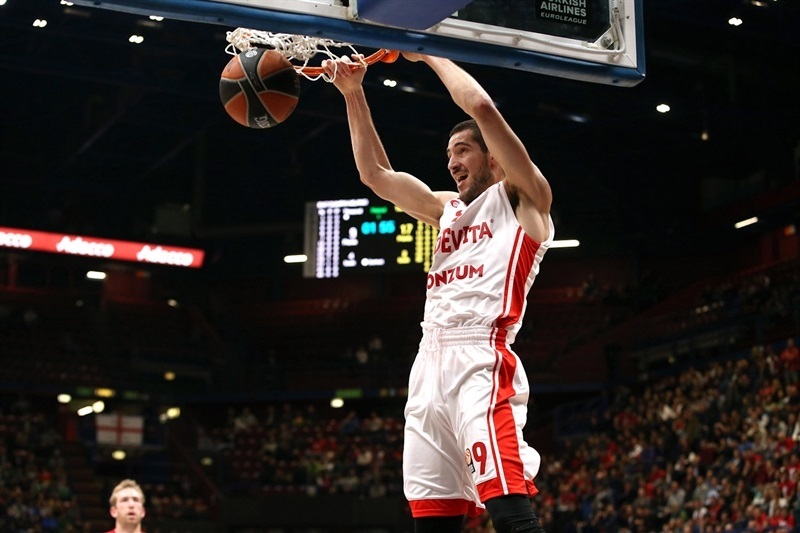 Babic made a running hook to open the fourth quarter for Cedevita, but Simon was waiting with a triple to take the lead back at 53-51 for Milan. Karlo Zganec whipped a back-door pass to Babic to tie it up again. Barac cleaned up a miss before a steal by Jenkins led to Lafayette's triple giving Milan its biggest lead of the game, 58-53. Bilan took 2 points back with a deft tip-in and Babic hit 2 free throws at 58-57. Then Bilan did the honors on the break of putting Cedevita back in front, 58-59, with 6:30 to play. After a Milan timeout, Zganec popped from the baseline to make it 58-61, whereupon Gentile lined up a triple from the corner for another tie game, 61-61. White flew in from the corner for a tip-in and Bilan was left wide open for a layup as Cedevita surged ahead again 61-65. Babic added a runner to the visitors lead that Gentile matched, but then Babic was back from the three-point line to raise the visitors' lead to 63-70. 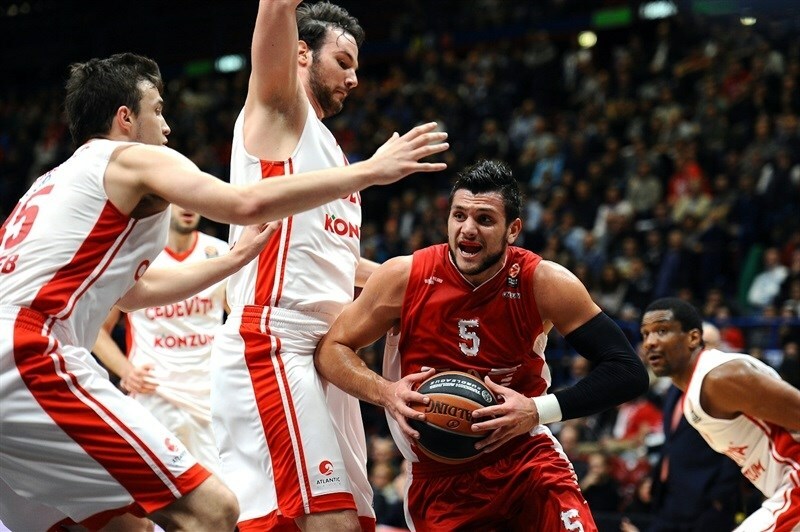 After a Milan timeout, great ball movement got 2 points for Zganec and a 63-72 lead for Cedevita. Milan needed points, but instead it was White drilling a corner triple that Gentile matched, but it was too little too late for Milan as the victory was already on its way back to Zagreb. "It was very important. I was afraid of this game, because after we won in Istanbul, we expected Milan to prepare good for us, and they did, but we executed our game plan excellent. Only in the beginning of the third quarter, we had problems. All game we suffered on defensive rebounds, but fortunately for us we won the game." "This is amazing. We got so much confidence after the win in Istanbul, and now we are continuing with great games. And that's it. We played tactically well in defense and in offense, and we have to play like this in the next games. The key of the game is team chemistry I think, playing all together."